This page describes how to use the Targeting tools available in webElect to do a basic filter of your voter dataset based on a range of criteria. Once you pull a list of voters, you can then output it in various formats, including into walk-lists for knocking doors, pre-filled petitions for gaining ballot access, mailing labels, and much more. Begin a target or query by selecting the district from which to pull your desired voters. From the Main Menu, click "Query Targeting" for your entire data set or "Targeting" to choose a sub-district or precinct(s). 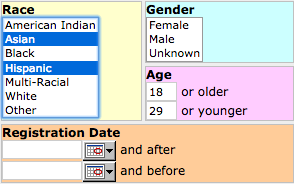 On the Demographic Criteria page, use the list of query parameters to target groups of voters. 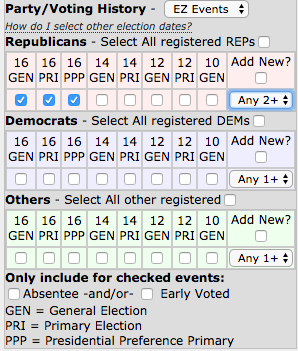 You can target by age, race, gender, registration date, party, voting history, voter score, and method of voting. Note: You do not need to select any value in a section if you want to include all the values for that section. For example, if you want all ages, you do not need to specify age. Just leave it blank. Once you have entered all necessary values, click "Next Page" in the top right. On the Group Criteria page, select to include or exclude any members/households that belong to one or more of your groups. If you do not specify a value for a section, all values will be included so no need to select all values. Select your desired criteria by entering it in the proper fields or selecting the desired values. To select more than one value, select the first value and then hold down the Ctrl key (PC) or Command key (Mac) and click on the next. To enter a range for Age or Registration date, enter the lowest value in the first field and the highest value in the second field. For example, to target voters between 18-29, input "18 and older" and "29 and younger". 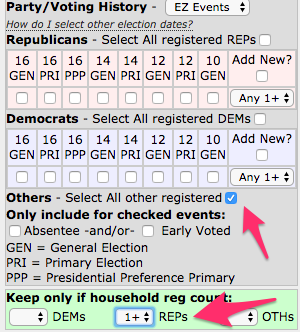 To look at elections further in the past, change the Party/Voting History drop down menu from "EZ Events" to "Events"
To target those who voted Absentee and/or Early in a specific election, select the election and then check the box(es) under "Only include for checked events:"
Use this section to filter based on the total count of registered voters in a house by party. For instance, perhaps you would like to target Non-Republican/Non-Democrat registered voters who live at a house with at least 1 registered Republican.